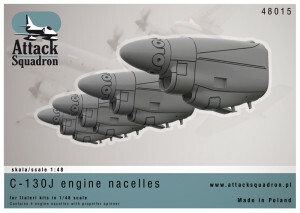 Attack Squadron starts series of 1/72 and 1/48 scale upgrade sets fot Italeri C-130 kits. See what kit problems are easily solved with our sets. Check what sets are prepared now. 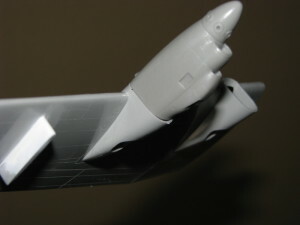 Main problem with kit is an error in fuselage section located in front of the wings. C-130 modeled by Italeri is short version of Hercules. It looks that manufacturer used scale drawings of long version and just squeezed fuselage section to fit length of short version. It results with to short engines and fuselage undercarriage sponsons. Attack Squadron has already released correct length engines and has prepared to release corrected sponsons. Some castings of Attack Squadron C-130 Engine nacelles both 1/48 and 1/72 scale have a mould error they are vertically about 1mm to thin to fit smooth to kit wing part. Thanks to Steve Eggers to pointing it. It is our error missed in production control. Please fill replacement parts form in our shop website, and then choose one of options listed below. Order replacement engines sent free. Note – we are preparing completely new mold and will send replacements in 1-2 weeks. Send engines back to shop you bought them and get refund according to seller regulations. It depends on seller policies. If you chosen options 1 or 2, please send us back your photo with engine set after receiving email confirming filling replacement parts form. How about making some replacement wheels for the C-130’s the kit wheels are not even close to what they should look like. The kit wheels looks they have hubcaps on them they should have that deep dish center look to them fix that please! any chance of producing the DIRCM , IR fairings found on the rear of many USAF and RAF C130’s ? I NEVER found these available and they’re an impossible shape to model accurately . Also the other modern C130 lumps n bumps ? 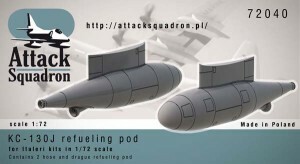 Any news on the 1/48 KC-130J refuelling pods. I would love to see a mod kit to represent the old “Roman Nose” C-130A versions. Specifically, modified birds like 53-3133 call sign Ginkko 33, the Lockheed NC-130A Hercules that conducted so many severe weather penetration test flights while attached to Air Farce Cambridge Research Laboratory (AFCRL). Any chance of producing some 1/72nd and 1/48th scale RATO bottles for the LC-130 and Fat Albert Airlines? I agree. I’m building Israel AF 130s and almost all of them use RATO at some time. 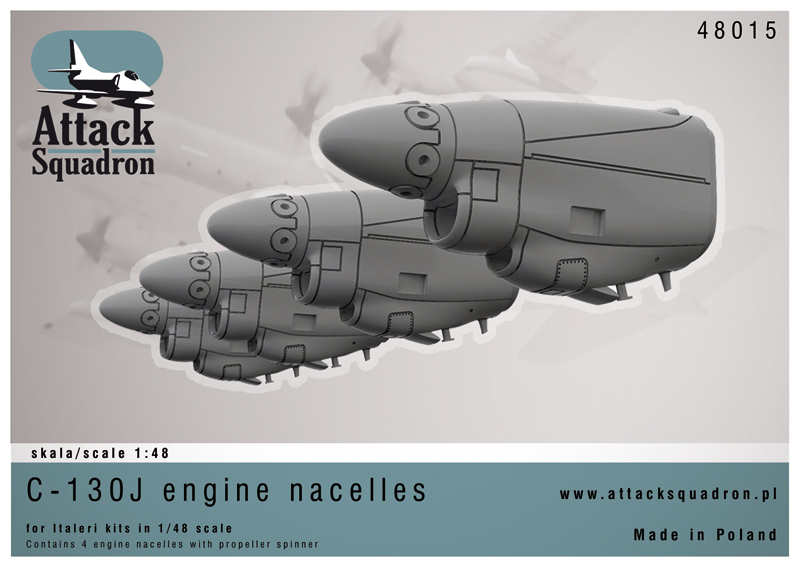 I have recently bought Attack Squadron 1/72 C130J replacement engines nacelles correction set from a model shop in Hong Kong. How do i know whether it is an earlier casting or not beside assembling or fitting it to the model?. I have yet to start on the project. 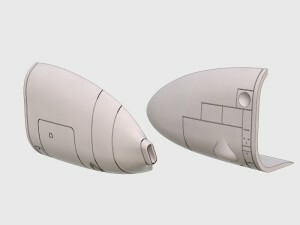 Early engine nacelles have solid block casting. New ones have hollow, thin wall castings. Hi, are there any plans to make 1/48 scale stretched version of the Hercules. There are stretch panels in 1/72 scale but not for 1/48 and I’d love to build a stretched RAF c.130j c4. Yep – same here. Looking for a strech version! RNoAF decals would be a huge plus! I used to fly on C-130P and N models (Search and Rescue modification) and would like to see a conversion kit to be manufactured for 1/48 and 1/72 scale. Aerial refueling pods, side scanner windows, nose mounted FLIR, modified back ramp for flares. 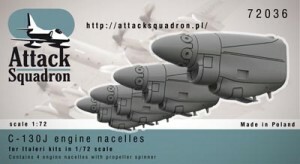 I have recently bought Attack Squadron 1/48 C130J replacement engines nacelles correction set. Can I tell if these are the early ones in the same way as the 1/72 scale nacelles, that is early engine nacelles have solid block casting and the new ones have hollow, thin wall castings? Yes, old are solid casting and new have hollow casting. Would love to see the short nacelles get some love.. including one peice detailed nacelles, props, and exhausts. Italeri parts (in 1/48 scale) are a pain to clean up. A full detailed replacement rear ramp would be fantastic as well! Wondering if your C-130 refueling/external fuel tanks set comes with the full complement of parts, like the long drag hose, the probe basket and the like to convert a C-130 to KC-130 in 1/48? 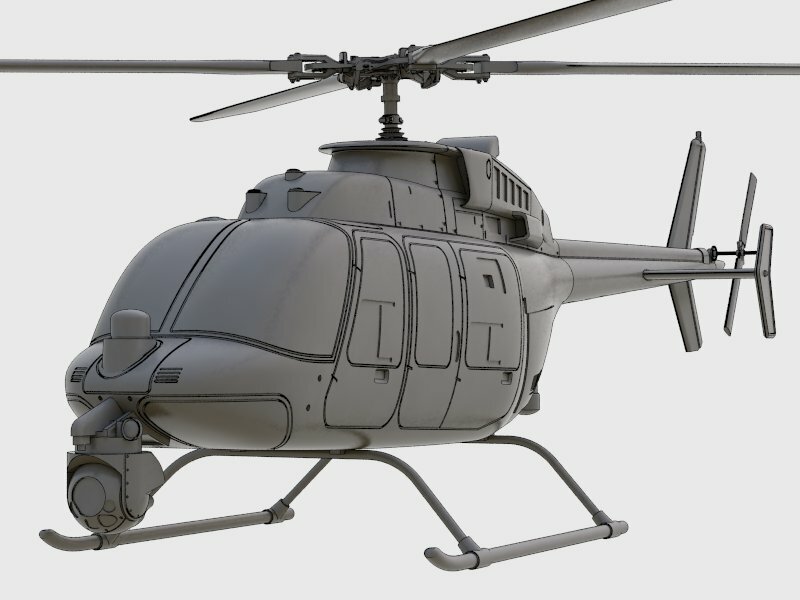 How about update to the 1/48 H model? Italeri’s C-130 suffers from the short engines and sponsons because it was originally issued as a DC-130A with three-bladed props. When released as a so-called C-130E/H all they did was add four-bladed props. I have your replacement parts and I must say the casting is exquisite! Well done, keep up the good work. How about some additions for Airfix’s new C-47; various radar noses, gunships, etc? what about a DC 130 thimble nose? in 1/72 and 1/48. Certainly – super nice with flaps in 1/48! Any plans on doing corrected nacelles for the 1/72 C-130E/H Hercules? Already available here in Arma Hobby! Another vote for the DC-130 ‘Pinochio’ nose, please ! any chance or flaps for the C-130 in 1/48? Im interested in buy a c-130H Flaps kit. Scale 1/48. For a testors model. Is Testors kit a different one to Italeri? Great resin! A nice C-130 cockpit up-grade set would certainly be useful. There are NONE out there in resin and photo-etch is so limited, dimensionally speaking. It would be hard to do. We need to discuss about with team. I too would like to see the rear loading ramp get the Attack Squadron treatment. Oh, and an LC-130 Skibird conversion in both 1/72 and 1/48. Skis, fairings and main landing gear ( what I can tell from photos is that the MLG is significantly different). Too much? 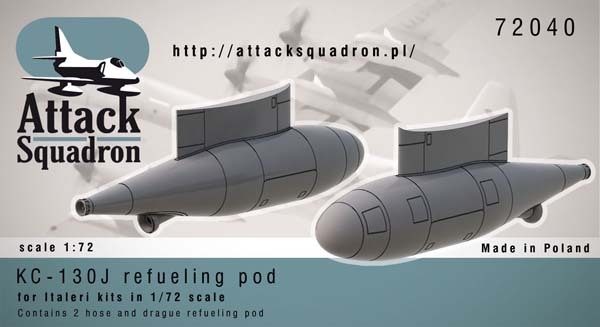 Ok then, I’ll happily settle for a USN 400 gal Douglas Fuel Tank in 1/48. My Scooters need more gas! Still loving your engines – such crisp blades. Keep up the great work. VXE-6 LC-130’s sometimes taxied on the snow with skis down wheels up configuration which had the ski oleos struts extended. Could you produce these struts using pot metal ? I wish I had the inclination to photograph this unique configuration.